This year, I decided to try out two tomato varieties I'd never grown before. To my surprise, I ended up with four new kinds of tomatoes in my garden, three of which were duds. Gold Rush Currant --- For the past few years, Blondkopfchen has been our favorite tommy-toe. The variety is prolific and tasty, but tends to succumb to fungal diseases before anyone else, so I figured it wouldn't hurt to try out a different type of cherry tomato. Unfortunately, Gold Rush Currant succumbed even faster and didn't taste good --- we won't be growing it again. 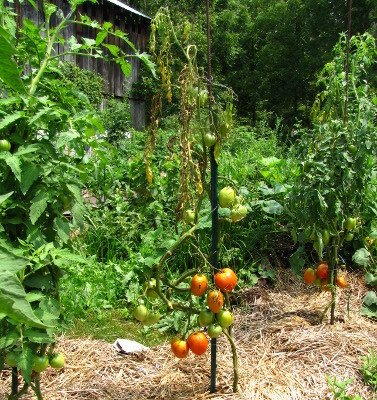 Amish Paste --- Most of our tomatoes are romas, which we turn into soups, sauces, or dry. I'm actually very happy with Martino's Roma, but so many people were glowing about Amish Paste that I had to give it a shot. Amish Paste turns out to be very similar to the Russian Romas we tried in our early years on the farm --- huge, juicier than most roma tomatoes, but extremely blight-prone. I don't mind spending a bit more time processing my romas if they don't keel over in our damp climate, so I ripped out the Amish Paste tomatoes this week before they could spread their fungi to the rest of the planting. Unknown small, indeterminate roma --- My final new variety for this year is who-knows-what! Since volunteer tomatoes come up all over my garden from compost (some of which is our ex-neighbors'), I can't be sure that this seedling wasn't from a storebought tomato our friends ate last year. 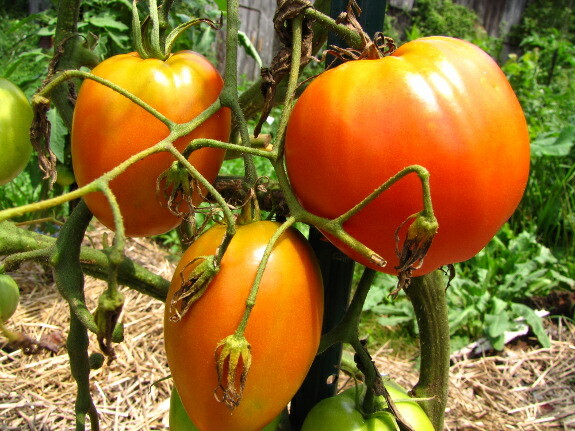 However, the sport came up in the row with the Martino's Romas, which makes me think that it might be either a seed of another variety accidentally slipped into the packet, or a rare instance of a naturally produced hybrid tomato. No matter where it came from, I like the unidentified variety so far. 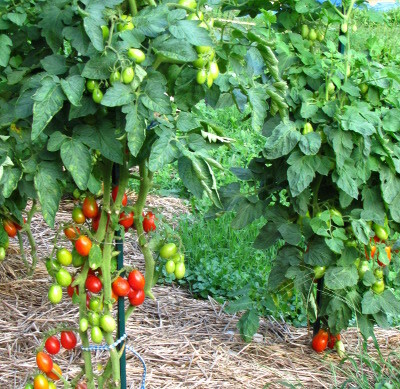 It fruits just as prolifically as Martino's Roma (although with smaller tomatoes), and is indeterminate, which means it might end up giving us more tomatoes in the long run. The little red roma does seem to be a bit more blight-prone (as you can tell by how high up I've cut leaves on the stem), but once the rains slacked off, the plant began to hold its own, unlike the first two varieties profiled in this post. I'm saving seeds and will try this variety out in more numbers next year. In case you're curious what that leaves us with, our regular tomato varieties are Martino's Roma, Yellow Roma, Stupice, and some tommy-toe --- maybe we'll go back to Blondkopfchen for next year? It's fun to try out new varieties, but I'm glad I put most of my eggs in the old-standby basket. Our chicken waterer is the dependable solution to filthy and easy-to-spill traditional waterers.